My hair just piles up, and up, and up, but individually, the hairs are fine, I just have more follicles than I think is physiologically possible. Maybe you can relate? You blow dry it, add product and thicken it up and give it shape, but by midday, it all just snaps back and flops. It needs more lasting volume! But, whether flat hair, fine hair, thin hair or receding hair, is it Aveda Invati to the rescue? 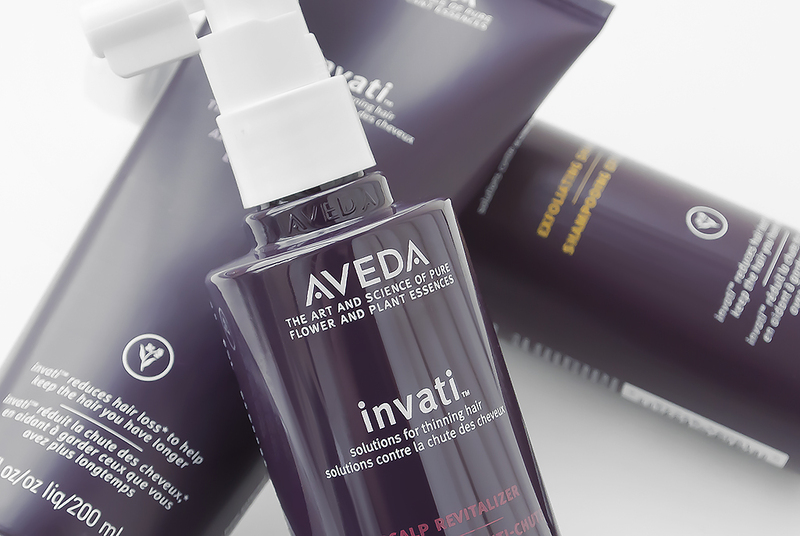 Invati is one of Aveda’s biggest ever launches and revolves purely around the core trio of products – Invati Exfoliating Shampoo, Invati Thickening Conditioner and Invati Scalp Revitalizer. It relies on Densiplex™, a thickening complex of natural plants and herbs including ginseng and turmeric. This Cradle to Cradle Gold Certified range, through clinical trials, has been proven to reduce hair loss due to hair breakage in just 12 weeks. It sounds very promising! The Exfoliating Shampoo is a weird one indeed and something quite unique to the world of shampoos, I love it. When I first read that it was exfoliating, my heart sank as I once tried the Aveda men pure-formance exfoliating shampoo, which is filled with tiny exfoliating beads that just didn’t seem to wash out, I was never really a fan. This relies on totally gentle, chemical exfoliation, I did spot Salicylic Acid in the ingredients list among others, so they’re really not messing about here. It lathers into a rich foam, but a word of warning, do NOT get this in your eyes, if you do, you’ll make sure you only do it once! It leaves your scalp fresh and hair feeling very cleansed, but definitely ready for the conditioner straight away. The exfoliation is designed to unblock follicles and pores whilst smoothing the scalp, creating a better environment for hair production. The fragrance is stunning, created by world-renowned clinical aromaologist Pierre Franchomme and Aveda master organic perfumer Ko-Ichi Shiozawa. Let me tempt you with – Safflower, Tumeric, Grape, Lady’s Thistle, Millet, Rosemary and Kukui. It has an overall very herby and planty smell (some real professional fragrance language there) and is very reminiscent of the fragrance used in the Aveda Men’s Pure Performance range. I should probably also mention that this has just received another award, this time from GQ magazine as the best new shampoo with feedback such as “an intense formulation – with intense results!” and “This has made a real difference to the thickness of my hair.” – So don’t just take my word for it! The Thickening Conditioner foams gently as you work it, thickening your hair as you massage and at the same time releasing a burst of the Aveda Invati fragrance. You can really feel it getting to work. Because the whole range is for all hair types, this conditioner hydrates your hair but doesn’t leave it greasy and lank, nor does it leave you gagging for more! It’s definitely not one of those conditioners that slime in and seem so disappear on contact, it really packs a punch and hair feels amazing as soon as you begin to rinse it through. The Scalp Revitalizer is incerdible with an intense formulation of chemical exfoliation and growth boosting actives. It took my a long time of researching and asking, but no one could give me a definitive answer whether you massaged it into a dry or wet scalp, so I took initiative and pursued logic by massaging around 3-6 shots into a damp scalp, as the follicles will still be warm and more open, allowing the product to penetrate more effectively. Once you’ve massaged it in for around 30 seconds to a minute, continue to dry and style your hair as normal, you will find that your hair immediately becomes more volumised and increasingly so after prolonged use. Customers have already started leaving 5 star reviews! This really has created a big impact in the hair care world and for anyone with fine or thinning hair needs to give this a go. The collection is available here from John Lewis or available here, direct from Aveda who sell the complete system for £86 (you need only the smallest amount at a time). This article first appeared on MANFACE written by Thom Watson. It was published on Thursday 4th October 2012 and was last updated on Monday 3rd April 2017 at 4:08pm. It's categorised under Aveda, Conditioner, Hair, Shampoo, Treatment where you'll find more related content. HI Thom , I’ve purchased the Invati shampoo based on your glowing endorsement of it in your black malva review. My issue with Black Malva was that it works a treat for colour, but it makes my hair very dry and it feels coated. I have read a lot of reviews about Invati and many people have also said that these products are drying. Have you found this ith any of the Invati products? If so was it just one or all of them you found this with? I have been loosing hair for a while in the mid back region of my head. Everyone in my family think its because of genetics, but……..I recently purchased this and have been using it for a couple of weeks now. When is the best time to use the scalp revitalizer? I use it in the morning after a shower and then at night before going to bed. I am pinning my hopes on this product!!! The best time to use the scalp revitaliser is any time you wash your hair, there’s no real optimum time of day to be honest, just an optimum scalp condition which is when your hair is slightly damp and your scalp is still warm with the follicles opened. I have been loosing hair for a while in the mid back region of my head. Everyone in my family think its because of genetics, but……..I recently purchased this and have been using it for a couple of weeks now. When is the best time to use the scalp revitalizer? I use it in the morning after a shower and then at night before going to bed. I am pinning my hopes on this product!! Hi Thom, thanks for your review. Have just bought the invati system and am loving it so far! Like Kevin, was wondering if you’re still using the products..? And if so, have you found it makes a difference in the long term? My hair is relatively thick and coarse, but I have been losing hair due to stress over the last several years so have my fingers crossed that the invati products will work! Yeah, definitely seen a difference, see my reply to Kevin for a bit more info, but you’re going to really enjoy this, it’s natural, powerful and very effective. Yes, I’ve been using it on and off all year and as you can read in the update, have had to take periodic breaks as my hair became too thick which resulted in it being more difficult to style. I can definitely say this has been one of the most successful volumising ranges I’ve discovered so far. Let me know how you get on Pearl! That’s brilliant to hear! I’d definitely recommend anyone trying this, even if your hair isn’t that fine or thinning and just wants a bit of oomph and lift. There’s a nice sampler of this range available on Latest in Beauty too. I was eyeing it up, wondering whether to try it or not. Based on your review Thom, I think I will.